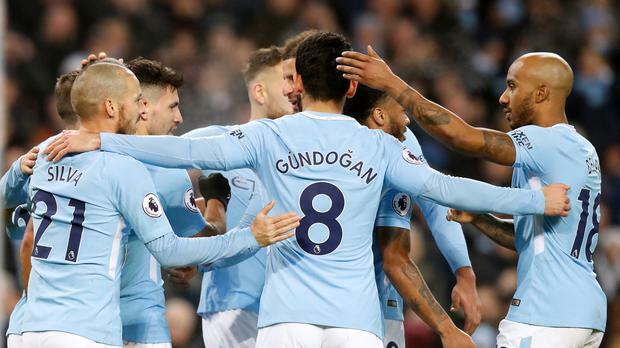 Manchester City's seemingly inexorable march towards the Premier League title continued with a 17th successive win as Bournemouth were beaten 4-0 on Saturday. The winning run began in August with a last-gasp victory away to Bournemouth, when Raheem Sterling struck in the seventh minute of stoppage time. It was far more comfortable on this occasion as Sergio Aguero scored twice, while Sterling and Danilo were also on target. Pep Guardiola's men still have dropped points just once this season, at home to Everton in the second round of matches on August 21. Third-placed Chelsea are now 16 points behind City following a goalless draw at Everton. Sam Allardyce's unbeaten run as Toffees manager continued. Everton have four wins and two draws since the former England boss' appointment. West Ham were the most recent team to defeat Chelsea, but they were beaten 3-2 on Saturday as Newcastle ended a nine-match winless run. When Marko Arnautovic gave the Hammers a sixth-minute lead, it looked like the hosts would build on their seven points in three games. But Henri Saivet equalised with a fine strike and Mo Diame and Christian Atsu netted within 10 second-half minutes to give the Magpies a 3-1 lead. Andre Ayew pulled a goal back after 69 minutes, having earlier had a penalty saved, but the Magpies won for the first time since October. The win saw Newcastle climb out of the relegation zone, while a 3-1 win for Stoke over West Brom eased the pressure on Potters boss Mark Hughes. Stoke took a 2-0 half-time lead through goals from Joe Allen and Eric Maxim Choupo-Moting. Salomon Rondon replied for the Baggies six minutes into the second half, but Ramadan Sobhi added a third in stoppage time as Stoke claimed just a second win in nine league matches to sit 14th at the halfway point of the season. West Brom's winless run is now a club-record 18 games. Brighton beat Watford 1-0 courtesy of Pascal Gross' goal. After seven matches without a win the victory means Albion are now 12th, while Watford have one point from six matches. Huddersfield are 11th, despite being held to a 1-1 draw at Southampton, who have now won just once in 10 league games. Charlie Austin gave Saints the lead, but Laurent Depoitre equalised for the Terriers. Managerless Swansea are at the bottom of the table after a 1-1 draw with Crystal Palace. The Eagles took a 1-0 lead through Luka Milivojevic's penalty, but Jordan Ayew equalised 13 minutes from time in the Swans' first game since Paul Clement was sacked as boss. Harry Kane scored a hat-trick as Tottenham won 3-0 at Burnley. Kane's treble saw him equal the record tally for league goals in calendar year of 36, held by Alan Shearer for Blackburn in 1995. The England striker converted a penalty after Dele Alli was tripped by Kevin Long. Next he picked his spot following Moussa Sissoko's pass and then Kane drove a low shot into the bottom corner.